According to a famous American Database website NNDB Pakistani President Asif Ali Zardair is a Citizen of America. This website contains complete information about more than 40000 famous personalities of the World. This website has also claimed that President Asif Zardari suffers from diseases like diabetes and depression. If Zardari is really the American Citizen his presidential election can be challenged in Pakistani Courts. 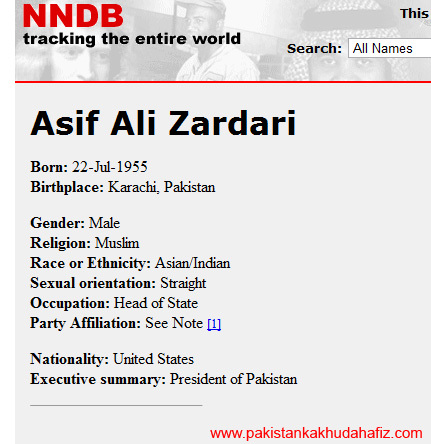 following is a snapshot of website NNDB about Asif Zardari.